ROME (Reuters) - Italian Prime Minister Matteo Renzi insisted on Thursday that Italy's economic strategy was sound and would lift the country out of crisis, after the euro zone's third-biggest economy unexpectedly fell back into recession in the second quarter. In a lengthy interview broadcast on La7 television, Renzi said that his government, which took office in February, was determined to get the economy back on track in due course. "We will work better and harder, but I promised to change direction, not to change the universe in three months time," Renzi said, adding that only a "comic book superhero" could turn around the economy in a matter of months. "Calmly, serenely, we are taking this country by the hand and pulling it out of the crisis," Renzi said. Data on Wednesday showed economic output contracted by 0.2 percent in the second quarter after falling 0.1 percent in the first. It was the 11th decline in gross domestic product in the last 12 quarters. Most economists now expect little or no growth this year, although the government's official target is a 0.8 percent expansion. Renzi is facing growing criticism for focusing more on long-term institutional reforms than on immediate economic measures. Renzi is battling to push through changes to the electoral law agreed with opposition leader Silvio Berlusconi and to abolish the upper house Senate as an elected chamber. 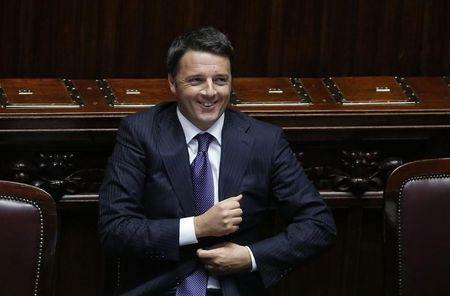 Despite the economic difficulties, the 39-year-old Renzi remains popular. Many Italians see little alternative to his centre-left Democratic Party, which polls show is by far Italy's strongest party, ahead of the anti-establishment 5-Star Movement. Berlusconi's centre-right Forza Italia has been badly weakened by its leader's legal difficulties and internal divisions. Renzi's comments echoed those Economy Minister Pier Carlo Padoan made earlier in the day. Padoan told lawmakers the government remained committed to structural economic reforms and encouraging investment, and he expected this would pay dividends in the medium term. "I want to underline that it would be wrong and misguided to judge the effectiveness of the government's policies on the basis of the economic trend of a few quarters, as many commentators are doing," Padoan said in the lower house of parliament. Padoan said the government's 2015 budget, to be presented in September, would have to take account of the disappointing growth trend, but both he and Renzi have ruled out further belt-tightening measures this year to meet European Union deficit targets. Renato Brunetta, the lower house leader for Forza Italia, rejected the assurances, saying "if we want to meet our commitments to the EU, a corrective budget is absolutely inevitable." Renzi said his government would go ahead with planned spending cuts next year, and that they would be enough to keep Italy's budget deficit under the EU ceiling of 3 percent of gross domestic product. "We could make spending cuts of 16 billion euros next year, and that would allow us to stay well under the 3 percent limit even if growth isn't great," Renzi said. Graziano Delrio, Renzi's chief of staff, admitted in a newspaper interview on Thursday that this year's 0.8 percent growth target, made in April, now looked "a long way off." But he said the government expected to take in more than it had previously forecast from the fight against tax evasion. It also expects to benefit from lower-than-expected debt-servicing costs thanks to a decline in government bond yields. The main economic stimulus adopted by Renzi was an income tax cut of up to 80 euros per month for low earners that took effect in May. Retail association Confcommercio said this week its effect on demand had been "almost invisible." Padoan told parliament it was "certainly premature to make judgments about the effects (of the tax cut) just three months after the introduction of the measure." Italy has been one of the world's most sluggish economies for the last two decades. Gross domestic product fell by 1.9 percent last year and by 2.4 percent in 2012. It is lower now, in inflation-adjusted terms, than it has been since 2000. Renzi has taken measures to cut red tape and curb corruption but they are widely considered insufficient. He has delayed a promised overhaul of rigid labour market rules until 2015 at the earliest. "The most recent forecasts envisage a stronger and more sustained recovery from 2015, and this is the medium-term context that the government's economic policy is based on," Padoan said.